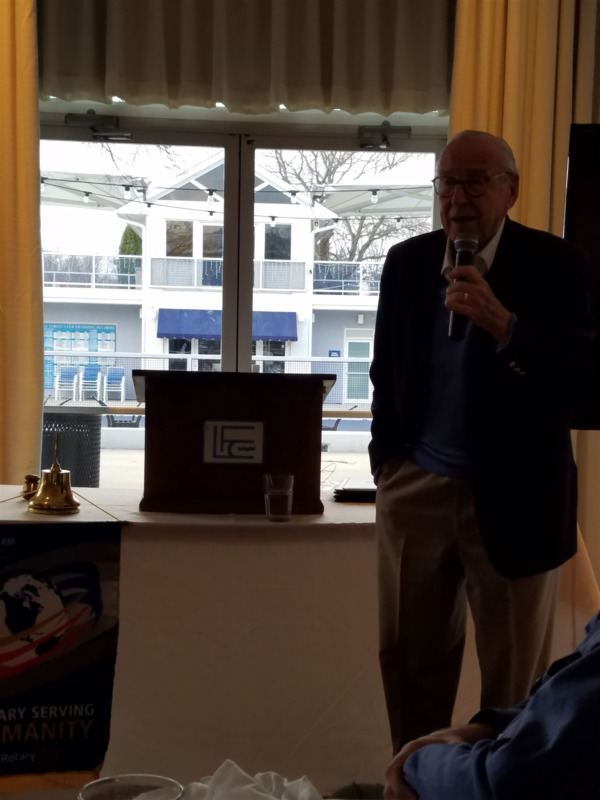 The Lake Forest - Lake Bluff Rotary Club was honored when famed American Astronaut, Captain James Lovell, chose to land at the Club recently. Captain Lovell shared some interesting stories from his Navy Pilot days (he flew everything of the era) and of course great stories from the NASA Gemini and Apollo missions. The reentry of Apollo XIII was so captivating it was made into the hit 1995 Ron Howard Oscar winning Movie, Apollo XIII; Captain Lovell was portrayed by Tom Hanks. After his heroic service to our country, Captain Lovell is still on a mission to give back. His name graces the VA hospital in North Chicago and he's working on a Museum project with the U.S. Navy at Great Lakes. Thanks to club member Jim Gregory (and a gravity bound object that hit the Lovell's home) for this out of the world presentation. Yes, he did utter those famous words "Houston, we have a problem" in response to a funny incident by our club President, Jayson Kaus.